MainAll NewsJewish WorldWatch: Can Anglo Israelis Influence Diaspora Jews? Watch: Can Anglo Israelis Influence Diaspora Jews? Emissaries teaching Diaspora Jews about Israel and Jewish values can have a great impact, Rabbi Doron Perez proclaims. 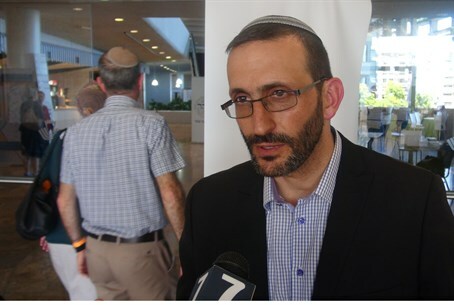 Arutz Sheva attended Wednesday a Tzohar conference focusing on the Anglo community in Israel, and spoke with Rabbi Doron Perez on how Anglo Israelis can influence Diaspora Jewry. Perez, the Director General of the World Mizrachi Movement, stressed his belief that "we have a new mission for Religious Zionism in the 21st century and that is how can we in the most impactful way transform Diaspora Jewry." "I believe that both the Religious Zionist community in Israel in general should impact in Diaspora Jewry and also specifically the Anglo community," Perez noted. "The Anglo community understands Diaspora Jewry," he emphasized. If they take on Diaspora Jewry as a mission, "I believe they can have an impact specifically because there is a cultural understanding." Asked what specifically the Anglo community in Israel can do to influence Diaspore Jewry, Perez responded with a call for emissaries, who are both promoting aliyah as well as educating Diaspora Jews with a love of Torah and a deeper connection to Jewish values. On the subject of integration, Perez noted the difficulties of older generations trying to fully integrate into the Jewish state, because of the severe culture difference. Thus, he argued, "Anglo communities have their place provided they're able to give their children correct integration." One thing though, Perez concluded, that Diaspora Jewry could bring from their countries of origin to improve Israel's Jewish culture is a greater sense of "community ethic."